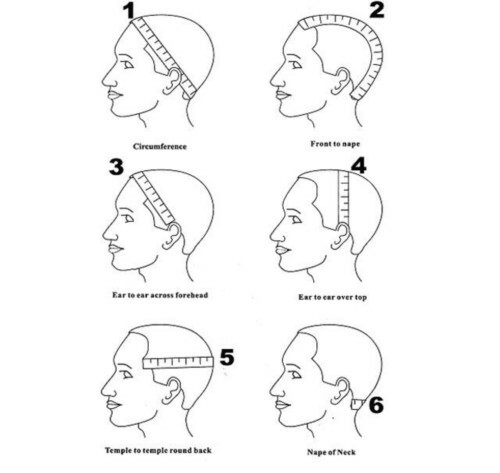 Before you buy, please do the following things if you don't know of the specification of your wigs. Send us the following information from 1 to 9 that is enough for us to make exact wig that only suit you. Pin hair as flat and as tight as possible before taking the measurements. For the best fitting results you should wrap or braid your hair how you plan to wear it under your unit. This will eliminate bulges that distort head contours. Enter the measurements in the boxes provided. Just download HERE for the customer's order form for your choice then email to us. Baby hair is short and thin hair on front or back or perimeter in order to make you look natural, the bleached knots is same : yes or not.